Send out an effective email marketing message is not as easy as it used to be. At SubscriberMail we have just completed a survey of executives and 63% of them have images turned off as the default on their email clients. What this means for marketers is that despite all the effort you go to in order to make the message look great in the inbox, it is often lost when it arrives. 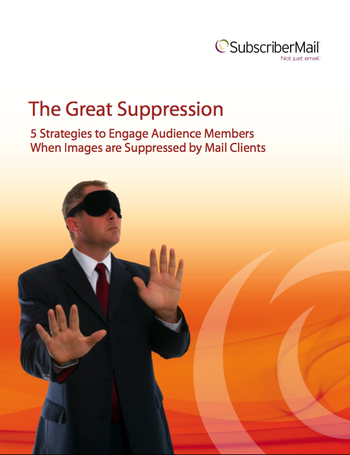 The SubscriberMail team has learned many great ways to optimize your messages, and today we released a new whitepaper titled The Great Suppression: Five Strategies to engage audience members when images are Suppressed by Mail Clients. You are welcome to download a complimentary copy. As a matter of fact, you may want to check out our entire White Paper Library, filled with great email content.